Did you fish a lot as a kid? We did, at crazy hours of the morning for 6 hours plus at a time. We even have trophies for it which is kinda funny for 3 girls. The best bit was the element of surprise waiting to see what type of fish would fly out of the water. The worst bit was a toss up between peeing into a bucket in a dingey in the middle of the Broadwater or smelling like dried live bait and scales for most of the day. I think this Australian Bass is in desperate need of a frame, could make a nice gift for a fisherman/woman, because everyone knows one of those right? Wow Rebecca, thats amazing embroidery! This is the most inspired and thoughtful piece of embroidery I think I've ever seen. I'm not joking...this is way acer than ace! Yes, we did a lot of fishing as kids on the Central Coast of NSW. At one stage when I was really tiny my father was concerned that I would impale myself with the hook, so he quietly removed it and covered the end of the line with bait (flour and water paste). I would sit there patiently in the row boat for hours, wondering why I never caught anything! Wow! Fish give me the heebie jeebies in a big way, but I really love this. It's nicely stitched, and that fabric looks awesome! This is fantastic! Super embroidery. I went fishing a lot as a kid since my father loved it. We grew up in NYC so my father went to Long Island to fish all the time. We spent our summers in Canada where my father fished everyday. We ate every fish he caught. He loved Bass by the way! Thanks for your kind words everyone, and thanks to those who shared your fishing stories, they sure make for good memories don't they! I love your embroidery. Yes, I do remember us hiring a dingy at Scarborough and catching heaps of whiting when as a child which I enjoyed at the time but couldn't do now. It's funny what you find out about people - never would have guessed that you were a champion fisherwoman. Wow, what an incredible piece. Wow, wow, wow - that is so gorgeous. Fish + crafty genius = perfection. Oh, how gorgeous is it? Your work is just beautiful. Hey Rebecca, what lovely subject matter. I think your bass is beautiful. Love the bass, excellent work! I have nominated you for the lemonade Stand award . .
Hi there! Just found your wonderful space! I did fish- with my pappy. Here in Texas Bass and Catfish were quite popular. I enjoy this work so much because it is so much like a drawing. 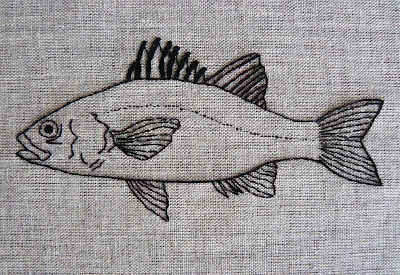 I am a painter and new to embroidery- have begun on paper-fun-and am interested in moving to fabric- I love the hemp fabric that you have used here. Thank you so much!! Everything I see her brings a smile to my face!